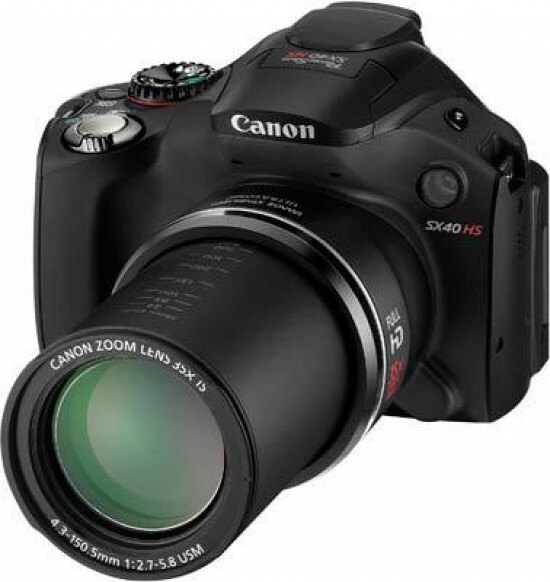 The Canon PowerShot SX40 HS is a brand new super-zoom camera sporting a 35x zoom lens which is equivalent to a focal length of 24-840mm. Replacing the previous SX30IS model, the SX40 HS features a 12 megapixel back-illuminated CMOS sensor, DIGIC 5 image processor, 4.5-stop optical Image Stabilizer with new Intelligent IS technology, full manual controls, full 1080p HD movie recording, 2.4fps burst shooting, stereo sound and a HDMI port, a 2.7 inch vari-angle LCD screen, flash hotshoe, a range of Creative Filters and an electronic viewfinder. 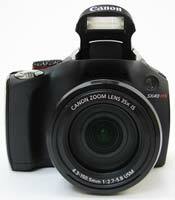 The Canon PowerShot SX40 HS is available in black priced at £459 / €529 / $429.99. Like most big zoom bridge cameras, Canon's PowerShot SX40 HS is a chunky beast not a great deal smaller than the entry level digital SLR it takes its styling cue from. However it is, after all, the whopper of a 35x optical lens that is the main selling point, boasting a comprehensively and creatively broad focal range stretching from 24mm to 840mm that would be otherwise hideously unaffordable or impractical for the average DSLR user. What is lost in quality compared with a DSLR is made up for in terms of versatility - with the photographer being able to rapidly switch from wide angle framing to candid close ups from afar - and, all things considered, fair value, though the SX40 HS is not an inexpensive purchase. Indeed, with a £459 suggested UK price tag, there's the obvious 'ouch' factor to get over when considering this Canon. Considering, that is, the fact that for a similar outlay you could purchase an entry level digital SLR, albeit one admittedly with standard 18-55mm lens (3x zoom), rather than 35x. Still, if compared with Panasonic's 24x zoom Panasonic Lumix DMC-FZ150 at a suggested £469.99, the Canon seems comparably reasonable on paper at least. Logically and stylistically the SX40 HS follows on from the SX30 IS model, which also offered a 35x reach, whilst its closest competition comes from Nikon's 36x Coolpix P500, which like this model also features an angle adjustable LCD screen at its rear, but a focal range that while starting wider at a 22.5mm equivalent doesn't quite match the Canon's telephoto setting at 810mm. Perhaps the SX40 HS should have tried to match its model number with a camcorder-like 40x reach. Of course, considering the zoom range on offer here a bulky body and hopefully some added weight courtesy of chunky 380-shot rechargeable lithium ion battery in the handgrip (600g when camera is 'loaded') makes perfect sense if we're going to be able to achieve anything approaching critical sharpness when shooting handheld towards the maximum telephoto setting. 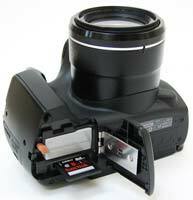 Image stabilization is of the lens shift type. Like its predecessor the SX40 HS again offers an Ultrasonic Motor along with here a Voice Coil Motor to deliver not only relatively swift but also smooth and silent zooming - crucial when capturing video in particular, for which a dedicated thumb-operated record button is provided. Maximum aperture is f/2.7. From the front, apart from the change of model number the SX40 HS (for 'High Speed') looks identical to the SX30 IS, with large AF illuminator/self timer porthole to the right of the gargantuan lens, pop up flash hiding just above, and hard plastic grip to the left. Offering a slightly roughened surface that is practical in preventing slippage but not all that comfortable, we managed to squeeze three fingers around said grip without scraping any knuckles on the adjacent barrel. The model suffix here has in part changed from 'IS' to 'HS' due to this PowerShot being one of the first Canon's to feature the company's new high speed Digic 5 image processor. This offers a host of quick fire continuous capture of up to 10.3 frames per second for up to eight shots and 120fps or 240fps slow motion video replay options at 640x480 or 320x240 pixels respectively, along with the now expected regular Full HD 1920x1080 pixels video recording capability at 24 fps. If you want 30fps this means a resolution drop to 1280x720 pixels. Here the lens shift image stabilization, again also a feature of the SX30 IS forebear, is offering the equivalent of 4.5 stops. Canon claims it's been enhanced further on this model, with the camera now detecting and choosing the 'correct' type of stabilization depending on the shooting conditions and the subject. The SX40 HS has purportedly seven options to select from: Normal IS, Dynamic IS, Powered IS (utilising camcorder technology to ensure the ability to record footage at a long zoom range), Panning IS (deployed in one direction and useful for recording racetrack action), Macro IS, Tripod Mode (image stabilizer automatically deactivated) or Dynamic macro IS. What has been pared back between this model and its forebear however is the resolution, which drops from 14.1 effective megapixels on the SX30 IS to a more modest 12.1 effective megapixels courtesy of 1/2.3-inch CMOS sensor that is back illuminated to enhance its light gathering properties; enhanced as wires don't get in the way of the sensor and so the light's path. While it's tempting to think this pixel drop has been undertaken to improve performance at higher ISOs, it seems Canon also had that aim in mind with the installation of the Digic 5 processor, with noise reduction performance claimed to be a whopping 75% better than the old Digic 4. Less noise also gives the opportunity to avoid using the flash at various focal lengths - which incidentally has to be manually raised rather than automatically popping up - and bump up the ISO instead whilst shooting handheld. Here ISO runs from ISO100 to a relatively modest sounding ISO3200. Another tweak is in relation to what the SX40 HS' maker is calling 'multi area white balance'. In practical terms this is supposed to maintain a natural colour balance for faces and backgrounds at the same time when say flash is used under tungsten lighting. The camera detects that there are two different light sources and so takes area specific readings. However though there is face detection and AF tracking on board, the number of AF points is notably less than on even an entry level DSLR: we get just one-point AF. 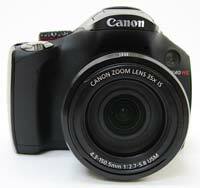 This is a camera that is far easier to pick up and start shooting with than most DSLRs however. Buttons and controls are well placed (and spaced) on the SX40 HS, with a shooting mode dial the size of a ten pen piece and a dime-sized shutter release button encircled by a lever for operating the zoom located at the top of the handgrip where it automatically falls under the forefinger of the right hand. This is a power zoom for those with larger hands who normally bemoan the small, precise buttons on most digicams, with the only the scroll wheel surrounding the control pad at the back being occasionally fiddly to operate with the thumb. Like most of its ilk, we found it easy to slip back and forth between settings when using it. Though most super zooms offer the chance to merely toggle back and forth through the focal range using a lever, we missed being able to manually twist the lens barrel to quickly get the framing we want, as on Fuji's rival FinePix HS20 model, which incidentally offers a more robust build but 'only' a 30x zoom, and, arguably, an excess of pixels at 16 million. The Canon PowerShot SX40 HS' shooting mode dial offers up 11 settings, ranging from scene and subject recognising smart auto mode through the usual program, shutter priority, aperture priority and manual settings through to sports mode, scene mode, more unusually a digital effects mode where the likes of miniature mode are discovered, plus there's a dedicated video setting from where the aforementioned slow motion movie capture options can be implemented; useful if you're shooting sports. The above combination does allow you to just point and shoot, but if you want to get more creative the options are there. Stills capture is JPEG-only though, there's no Raw option which may be a deal breaker for some, though there are two further customizable settings on the shooting mode dial for those who do like getting more hands on. And despite there being a dedicated video control on the shooting dial, you don't actually have to set it at this position to begin recording (it's a means instead of adjusting the aforementioned video settings from regular speed to slow mo via a press of the 'function set' button). Simply hit the dedicated record button no matter which alternative stills mode you're in and the a second or so later the screen display will narrow from the regular 4:3 to 16:9 to ape how the video will look when replayed on your flat panel TV. There is, as we'd expect, a mini HDMI connection provided under a rubber flap at the side for this purpose, though unsurprisingly no lead comes bundled with the camera. Disappointing though that the 2.7-inch screen, whilst being adequately sized, offers a modest resolution that at 230k pixels wouldn't look out of place on a pocket snapshot. We've come to expect more from a camera in this price bracket. Press the obvious on/off switch next to the shooting mode dial and the camera powers up in just under two seconds, which is respectably swift. The lens barrel visibly extends to max wide-angle 24mm setting as the rear LCD bursts into life. We know the setting as, as on the Fuji HS20, it's marked atop the lens barrel, as usefully are the incremental settings all the way up to 840mm, which gradually reveal themselves as the lens extends outwards from the body. Since this is a bridge camera as well as a power zoom, at the back we have both vari angle LCD monitor and fixed electronic viewfinder just above. This automatically comes into play if you've twisted the LCD screen to face inwards to the camera body. There's no eye sensor beneath or above, nor is there a dedicated button for swapping between larger screen and smaller EVF, so it would be very easy for most users to regularly bypass this facility completely. As it is, EVF resolution is a so-so 202k dots, and being able to twist and rotate the rear screen means that even if light reflections do render visibility momentarily tricky, a quick tilt and it's rectified. This, when combined with the broad focal range, certainly makes getting the shot you want a whole lot easier - and faster - on the SX40 HS. Whether you'll always be happy with the quality of the end image is an issue we'll address in due course. Give the zoom lever a toggle with the forefinger and the camera slides from maximum wideangle to extreme telephoto in all of three seconds, the minimum and maximum (infinity) focus ranges provided via small text top of screen and rapidly changing as the lens moves forward or back. There is a noticeable mechanical buzz as the lens makes its adjustments, but it's not distracting. Switch to recording video however and the zoom action slows so that the transitions are even smoother, with the lens taking 8 or 9 seconds to move through its focal range. In this setting the mechanics of the lens are less noticeable, which is exactly as we'd want. 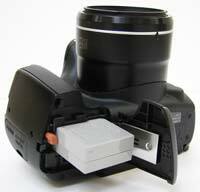 At the back of the camera the LCD screen dominates, sitting squarely central below the EVF, which feature a rubber surround to the eyepiece and dioptre wheel for adjustment of visibility alongside. 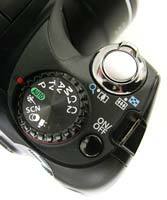 Above left and right of the EVF are a direct-print button, this being a Canon model, plus video record button. The rest of the controls are ranged to the right of the back screen, the uppermost allowing users to jump through groupings of frames at a time when reviewing images. The next one down forms a dedicated playback button, and the third and bottom in the row allows the single AF point to be expanded/contracted or moved with the aid of the multi directional control pad alongside - as long as you're in one of the creative shooting modes that is. Otherwise in smart auto mode, subsequent presses will turn face detection on or off, while in playback mode this multi-use control usefully doubles up as a delete button. It requires a degree of playing around to discover this as unhelpfully once again the full manual is provided on CD only, with only a cursory quick start booklet in the box which doesn't cover any more than the already self explanatory basics. The four way control pad at points north, east, south and west variously offers a means of adjusting exposure compensation (+/- 2EV), selecting from the ISO options (ISO100-3200), self timer (off, two seconds, ten seconds or a 10 second option that fires three consecutive shots) and finally adjusting focus, with switchable settings between normal, macro and manual options offered if required. The latter allows use of the scroll wheel to dial in distance settings from 0cm to infinity, with an enlarged central square on screen giving a rough idea of whether the picture is properly sharp enough. 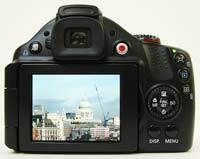 A press of the function set button in the midst of the scroll wheel/control pad brings up the regular L-shaped menu that will be immediately familiar to any Canon compact camera user and presents essential functions at a glance. In program mode for example, from the top of this toolbar we get the ability to adjust white balance, select from the various 'My Color' options which include our favourite vivid saturation boosting option alongside the ability to specify darker or lighter skin tones or shoot in sepia or black and white in camera. Next down the list is a bracketing option, with either three shots automatically taken at three different exposures or three different focal distances, plus the option to switch from single to continuous capture, again adjust exposure compensation to +/- 2 EV, or swap metering between evaluative, centre weighted and spot. Image aspect ratio can be swapped from the factory default of 4:3 to 16:9, 3:2 or more unusually even 1:1. It's via this L-shaped toolbar that PowerShot users can also specify large, medium or small files and even adjust video resolution on the fly, from 1920x1080 through 1280x720 and down to 640x480 pixels. Alternatively if the camera has been set to its smart auto mode then only image aspect ratio, file size and video resolution can be adjusted. The other options do not appear at all. The final two buttons on the camera back are for the self-explanatory display and menu. Subsequent presses of display will call up a nine zone compositional grid, or turn off the LCD entirely at which point the EVF above automatically illuminates and comes into play. A press of 'menu' meanwhile brings up three easy to follow folders on screen; a capture folder, set up folder and my menu folder for quicker access to your more frequently used settings, should you choose to pre-set them. Interestingly among the usual suspects in the capture folder the microphone level can be adjusted, as can a wind filter be turned on or off. These menu options can be tabbed with via a thumb press of the four-way control pad or of course scrolled through faster using the surrounding wheel. If still viewing the camera from the back, further points of interest on the SX40 HS include the covered HDMI and AV ports on the right flank, and a single speaker located on the left, which also features the hinge about which the variable angle LCD screen pivots. The bottom of the camera features an off-centre screw thread for a tripod next to which is a sliding plastic door that protects the battery compartment and adjacent slot for SD card. So, incidentally, if you place this PowerShot on a tripod you'll have to unscrew it first to remove the memory card. At the end of the day the Canon PowerShot SX40 HS offers a relatively easy to use tool for anyone looking to get closer to their subject from afar on those occasions when simply shuffling forward or back with your own two feet is not an option. But what of the image quality delivered? Is it acceptable given the large lens and relatively small sensor or have two many compromises been made? Read on to find out.